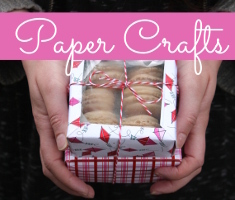 A few months ago I set out on a quest to make clothes, accessories, a bed, and storage for my niece’s American Girl doll – and blog about them. Of course, I needed a model the same size but less expensive! I purchased my doll Audrey Ann, an Our Generation doll, who plays an important role in sizing things correctly for an 18″ doll. 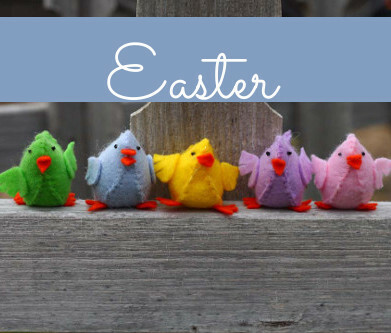 That was the justification given to my husband and son – but they still think I have gone a bit bonkers. 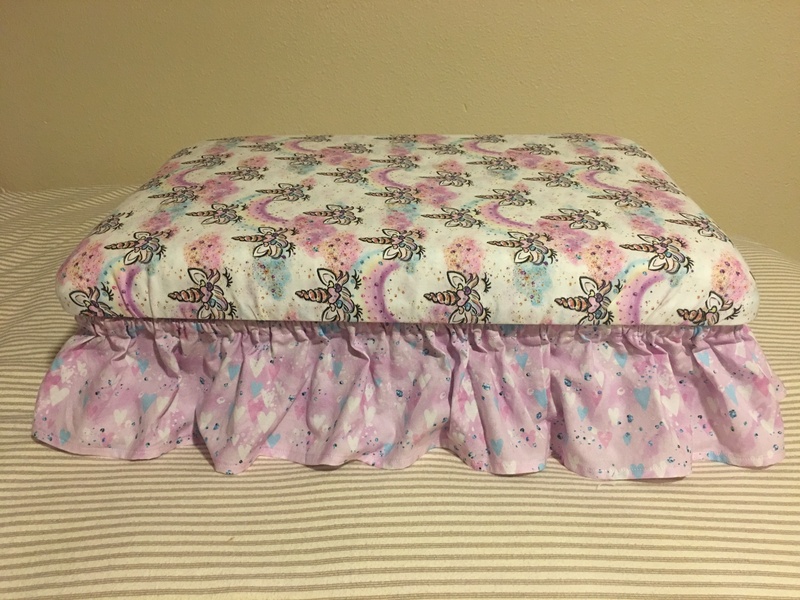 Perhaps I have gotten carried away – she now has her own bed, and several outfits with matching jewelry, headbands – and I plan to make shoes too! 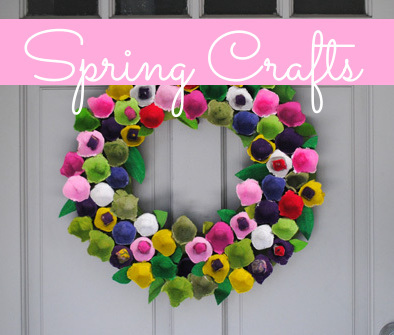 I will share the fun of making these in upcoming Think Craft postings. While perusing Pinterest for inspiration, I found many examples of a “doll storage and bed” combination made from a sweater storage container. It is unclear who came up with the idea first and most were just images – but I found one tutorial at Beneath the Rowan Tree. I did not follow her directions though – and just figured it out as I proceeded. Today’s posting will cover making the “bed skirt”, mattress and fitted sheet for the storage bin for the two storage beds I made – one for my niece and one for Audrey Ann. 🙂 Making the pillows, pillowcases and quilts will be in my next blog. 7 gallon clear plastic under bed storage bin – measurements based on this bin; avoid bins with handles for closing. Clover Press Perfect Hot Ruler 2 1/2 x 10 in. 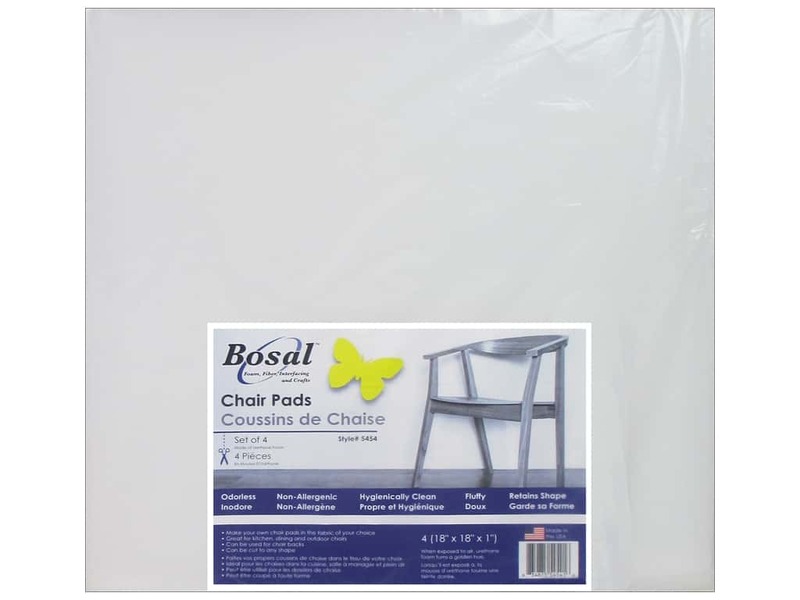 I ordered one package (set of four) of Bosal chairs pads which was enough for both mattresses. I joined one whole and part of a second pad with Batting Seam Tape, pressing the tape lightly with a Clover Wedge Iron to adhere it to the foam, and trimming it to fit the bin lid – approximately 15-1/2″ x 23″. My Olfa Rotary Cutter 60 mm Deluxe, Omnigrid Omnigrip Non-slip Ruler 8 1/2 x 24 in, and cutting mat worked well for this step. I wrapped the foam pad with polyester quilt batting, overlapping one side almost to each edge. This overlap will be on the bottom to compensate for the indentation of the center of the lid. I trimmed the ends just enough to cover the edge, folded them like wrapping a package, covered the edge with batting seam tape held in place by pins, and pressed gently with the iron. Another strip of batting tape was applied to cover the edge of the previous tape to secure it.This was repeated for the other end. To make the mattress pad cover, I cut one 16-1/2″ x 24″ (front) and two 16-1/2″ x 17-1/2″ (back) pieces of white fabric. I used the envelope method for making pillow cover backs, After folding the 16-1/2″ edges of the two back pieces under about 1/2″ and again 3/4″ and pressing, I topstitched about 1/2″ from the folded edge. Laying the front piece right side up and the two back pieces right side down with folded edges overlapped, I sewed all around the edge with a 1/2″ seam – sewing over the folded areas a couple of times for extra strength. After trimming the corners, the cover was turned right side out and pressed. Then the mattress was inserted inside the cover. I applied the two layers of sticky back hook and loop tape to the top of the sides for the bed skirt to attach to. To make the bed skirt, I cut three strips 7″ wide x the width of fabric (selvage to selvage) – for each bed. I folded the bottom edge up 1/4″ and again 1/4″ to make the hem. The Clover Press Perfect Hot Ruler 2 1/2 x 10 in. worked well for this step. Then I made the casing at the top by folding the edge down 1/4″ and then again enough (about 3/4″) to make the finished size 5-1/4″. The casing should be able to hold the 3/8″ or 1/2″ elastic. I unfolded the ends and sewed them together with a 1/4″ seam allowance – making a large circle. I pressed the three seams in one direction so I could thread the elastic through without resistance from a seam. Then I refolded the folds and sewed topstitching along the first folded edges for the casing and hem. I cut a piece of the elastic to go around the top of the bin generously; it was trimmed later. After securing one end of the elastic to an opening in the topstitching at a seam, I gathered the skirt on the elastic – trying to have the gathers even – and pulled the elastic gently but tight enough to stay on the bed once stuck to the hook and loop tape. I trimmed the ends of the elastic, overlapped them, and sewed them together securely with machine stitching and backstitching. No photo – but the last step was to adhere the gathered top of the skirt to the sticky hook and loop tape, trying to spread it evenly around the bin. 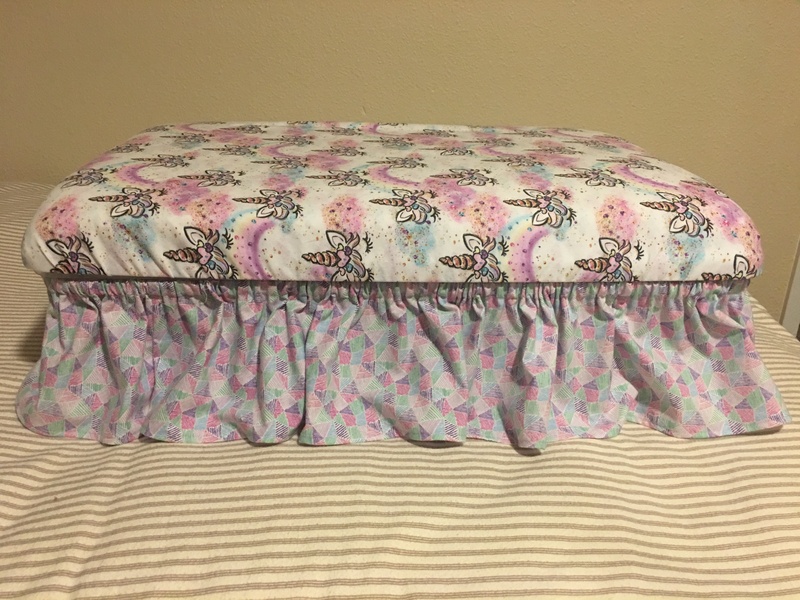 For the fitted sheet, I cut a piece of fabric 23″ x 30-1/2″ for each bed. After folding the fabric piece in quarters, I cut a gentle curve for all the corners at the same time so they would match. I folded the edge to the wrong side 1/4″ and again about 1″ for the elastic casing. It took several pins to have a smooth curve before pressing and topstitching the casing close to the first folded edge. I left a small opening in the casing to insert the elastic. After a bit of maneuvering, I was able to cover the lid – with the mattress on top of it. I tugged until the sheet’s gathers were fairly even, pulled the elastic tight, tied a secure square knot. I didn’t bother to close the small opening in the casing. I was glad to find the lid still locked onto the bin even with the sheet on. Here is the first bed I completed – ready for the pillow and quilt to be made. By the time I made the second bed, I had learned how to use my rolled hem foot! I sewed the hem on the skirt first, then folded the casing to make the skirt 5-1/4″. The hem looked great and it was so much easier! The measurements in these instructions are for the specific bin I used. Hopefully, you can make adjustments if yours is different. Soon I will post about making the pillow, pillowcase, and quilt – please check back.